Every year around 18 billion pounds of plastic flows into the ocean, dramatically impacting the health of marine animals and the environment. Forty percent of these plastics are considered ‘single-use plastics,’ (SUPs) with one the most infamous SUPs being six-pack rings. As far back as 1987, these carriers have killed as many as one million seabirds and 100,000 marine mammals each year, according to a report from the Associated Press. And even with regulation introduced in 1994 mandating degradable six-pack carriers, companies have still not been able to solve for this growing issue. Now, one company is making huge strides by not only introducing a plastic-free carrier, but incorporating its own byproduct waste in the process. Last week, Corona brands announced it will trial 100 percent plastic-free six pack rings. The initiative will start in Tulum, Mexico, at the beginning of the year and expand to the U.K. by 2020. 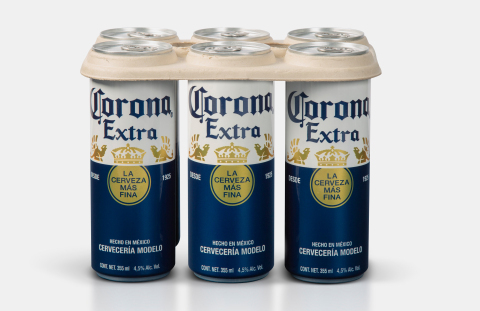 Corona is the first global beer brand to announce the use of sustainable six-pack rings. The rings are made with biodegradable, plant-based fibers, beer brewing byproducts (spent wheat and barley) and other compostable materials that are not harmful to wildlife when ingested. The new rings are just a part of Corona’s efforts to address ocean plastic through a partnership with Parley for the Oceans, a collaborative organization that addresses major ocean threats.